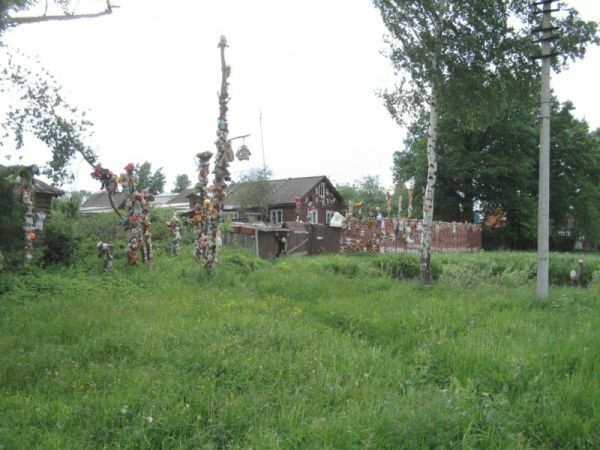 Very strange dwelling was found in Russian countryside. 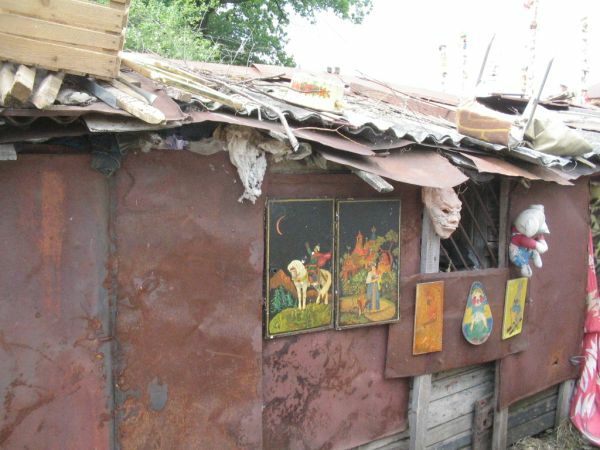 What is this, some voodoo sect shelter? Or is it a some kind of design solution? Are you serious? That’s crazy. Looks like the house of that crazy american milkman who shot 5 girls in a school. Yeah — this happens in America too (although I must admit, this is more extensive than I’ve seen before), and probably many other countries that have lots of “disposable” goods. 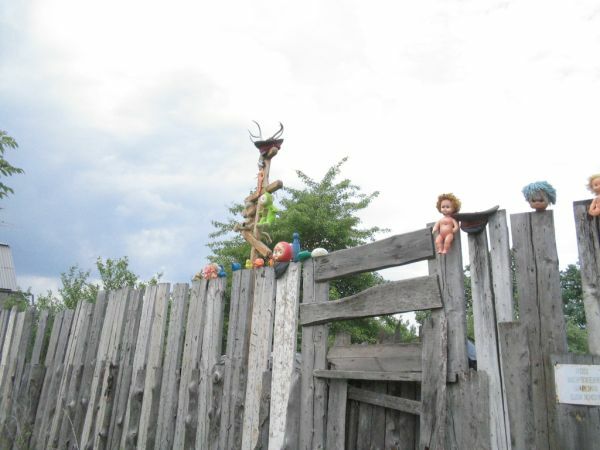 You often see someone who lives near a junkyard with lots of dolls on the fence or house, or even attached to the grill of his/her car (very common). I think it’s very interesting, surreal. 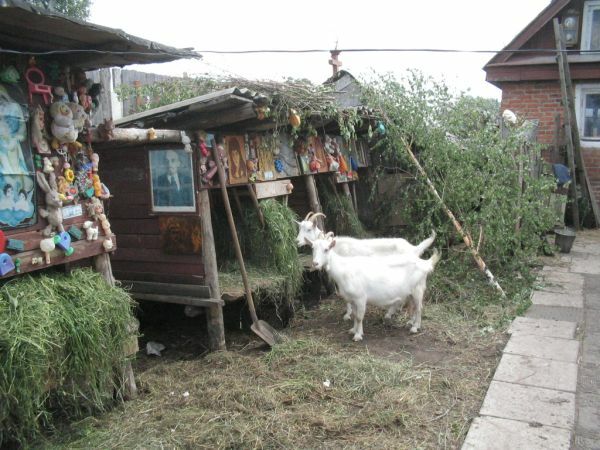 nice touch: portrait of Lenin on the goat-shed!!! HA HA! 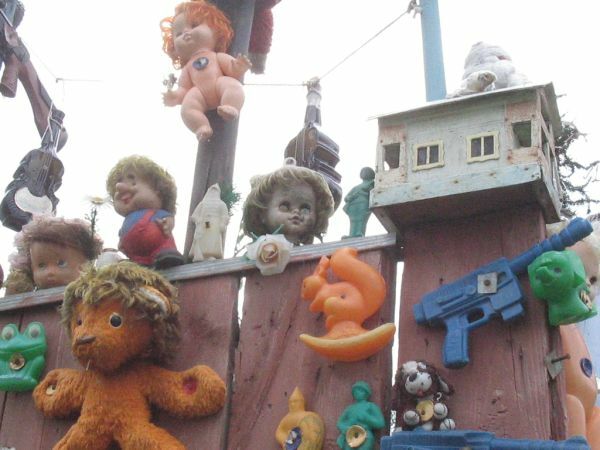 Possibly, the one who lives there was working on some toy factory. I remember a lot of people standing on the road (in the middle of the way from Moscow to St. Petersburg) and selling toys. Why? Because it way their salary. I even bought one nice huge dog. Since most of us come from different countries, I’m sure we realize this. So there is no point of restating this in every article (and I’m not just talking about you, because everyone does it). I’m sure the point of these articles are not to say that these situations are only common in Russia but rather just to show something from Russia. It gives me the creeps!! 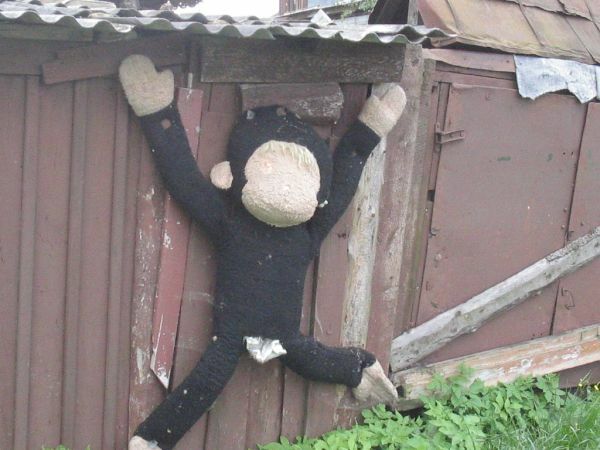 We had a similar looney-tune here a few years back, except that he/she used plastic fruit instead of dolls. 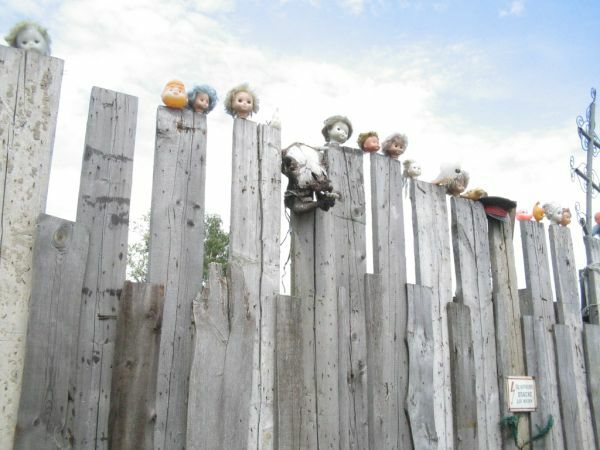 This could be creepier only if all of those things were nailed only from the head with a single nail. Sick. No one will break into his house to steal his TV thats for sure! I think somebody should steal his TV before things get worse! 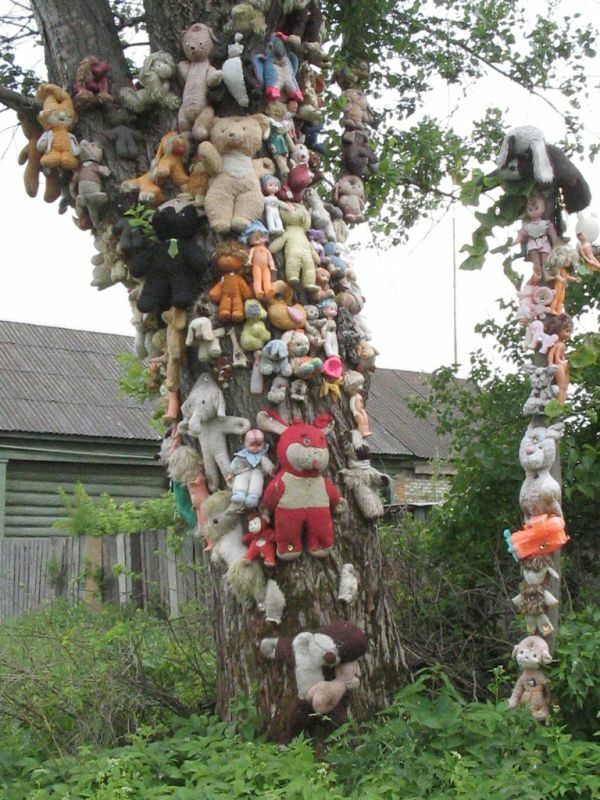 Looks much like the heidelberg project in detroit with the doll heads and stuffed animals stuck on trees. This is too weird, I would never befriend a person who’s home looked like this, (not art in my eyes sorry) I probably wouldn’t even talk to them , and honestly this looks more like the work of a physco!!!! Holy creepiness, Batman. 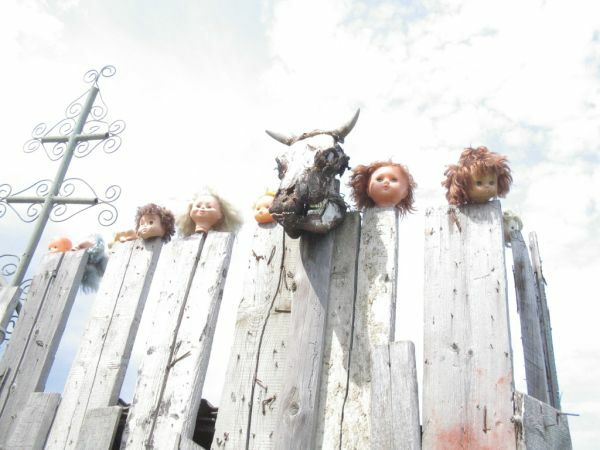 Someone needs to show it to Rob Zombie so he can use it for the set of a movie. 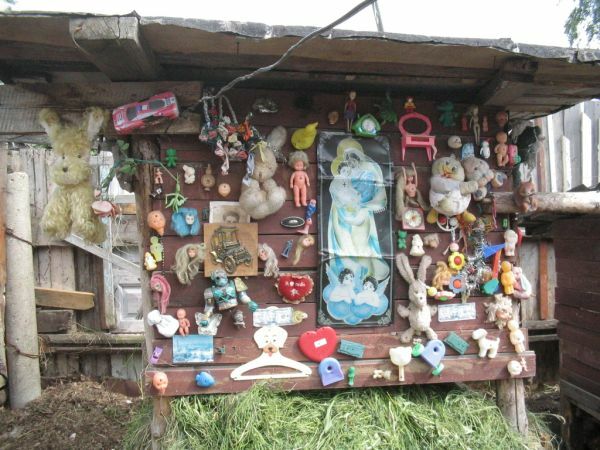 Hermit Don Julián Santana started something like this in Mkexico years ago, after a child drowned and died in a canal. 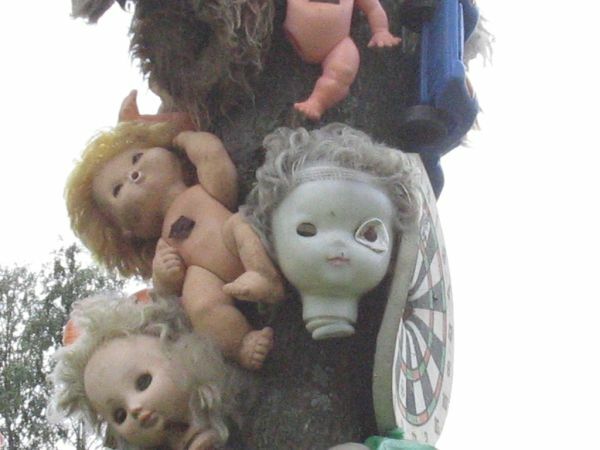 The place is now known as La Isla de las Munecas or “Island of the Dolls” in English and has become a great hit with tourists. THis is one of the weirdest and most disturbing things I have ever seen. 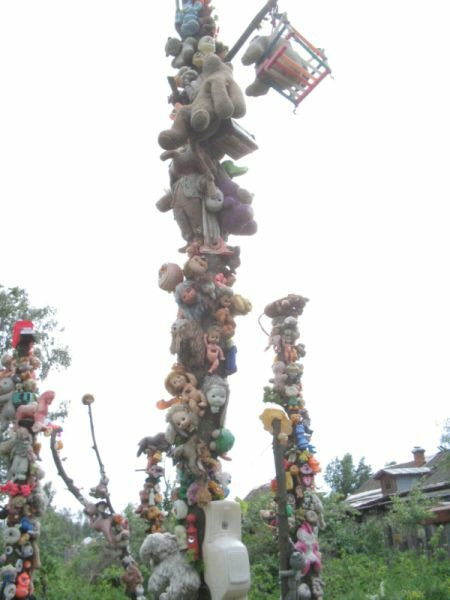 I have a neighbor who hung a big bear from the mesquite tree branch and it disturbed me to no end. I collect stuffed animals like the fairy in The Velveteen Rabbit and try to find them good homes. I would never want any of my animals ending up like this crazy place. 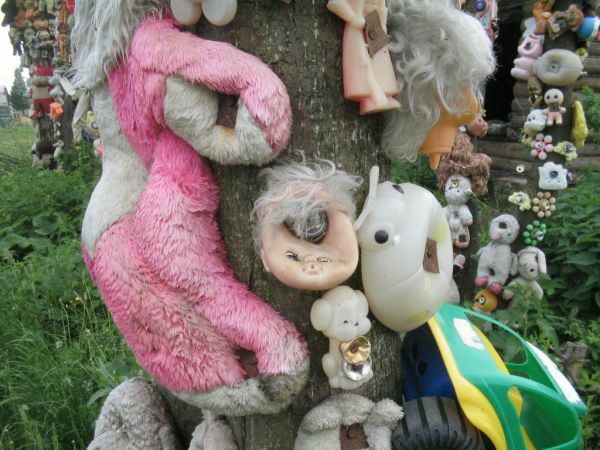 Stuffed animals belong in the house sitting on a bed or chair, not nailed to a tree. This is beyond disturbing. I feel I would have to rescue those poor animals and toys. 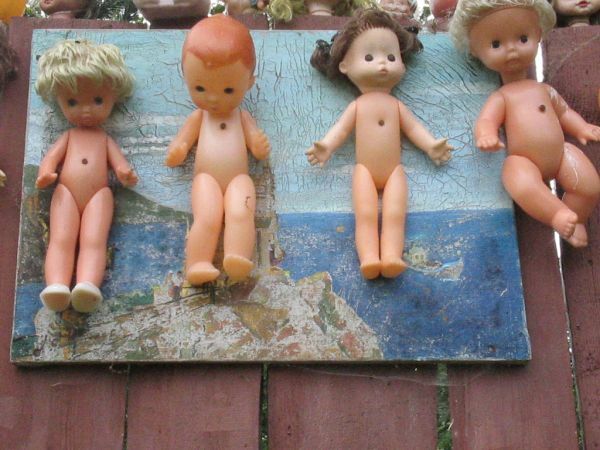 No one respects the beauty of a stuffed toy or the work that went into the dolls. 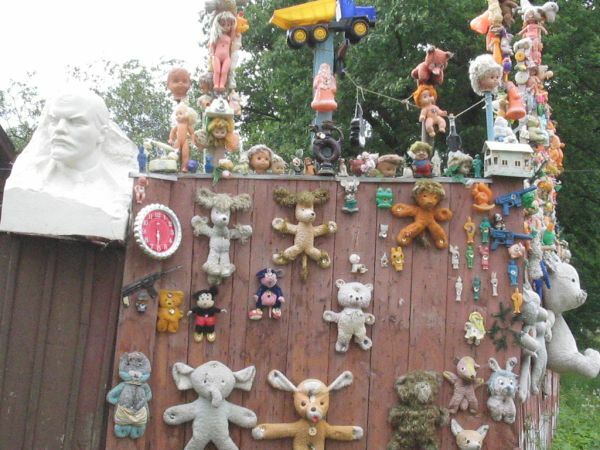 This is really sick and whoever lives here needs a psychiatrist or an asylum.